A sprawling area located at the southwestern tip of Queens, Long Island City is actually many neighborhoods rolled into one. Overall, LIC has an industrial-turned-artsy vibe, with old factories and buildings reincarnated as TV and movie studios, galleries, funky museums and fancy condos. Although there aren't a ton of kid-specific attractions in Long Island City yet, there are lots of fun things for families to do together, like exploring MoMA's PS1, taking a free art workshop at the outdoor Socrates Sculpture Park, romping in the state-of-the-art playground and sprinklers at Gantry Plaza State Park, and eating at one of the area's many casual eateries. 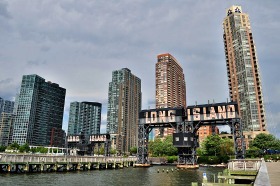 Our guide to Long Island City includes info on all of these as well as many other suggestions for ways to spend a day (or more) in Long Island City, Queens.